Hi everyone this is my first post and I need some input and info please. I got a 74 S&H with the auto on the floor, numbers matching car all original except paint originally just red, I'm a fan of manual transmissions and would love to see my baby with a 6 speed manual down there instead of auto, I think it would help value of it in long run over the loss of numbers matching I'd like some opinions and any info on what the best route to take to do it would be thanks Dan. The Torino's of this year are not bringing big money for the most part so I say build it the way you want and if you ever sold it people always like gear jammin in the old cars better anyway.So I say it should sell just as easy. In reality it is a 74 Gran Torino. Not a true S&H LE car. So the car has already been changed/modified/no longer stock. I say that not to put it down but to say... build it the way you want, it is not going to change what it is worth. 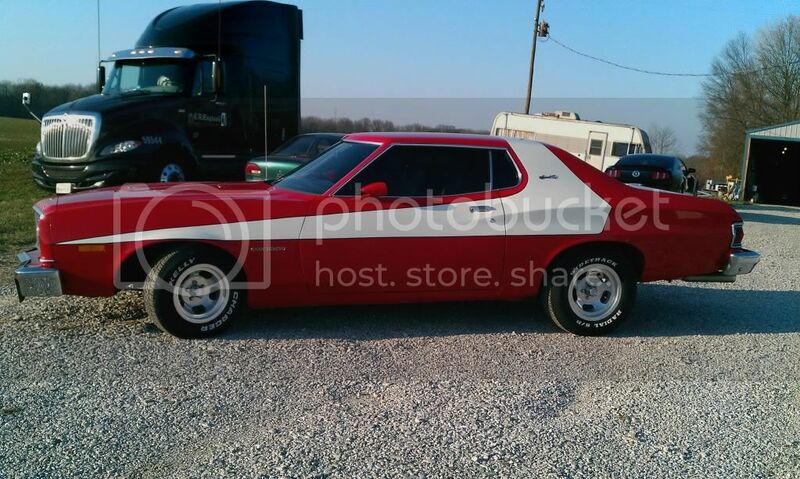 A 74 Gran Torino is worth what someone is willing to pay, a modern manual done right COULD add to the value. If the modern manual is what you want to do to it... it just added value for YOU and that is what matters! I would start by pricing out the components first,after you get over the shock of what the cost of parts will be.you may have to preform the work yourself.I'm guessing that you'll be near the 2k mark for the parts.And that would be for factory pedal assy,Toploader 4spd set-up.If you go with a hydraulic clutch,you would need to fabricate the set-up as i don't believe a bolt in assy is available.do your homework on this,I converted my first torino to 4spd way back in the early 80's,I spent about $750 then.I do agree with going with a 5 or 6spd.being that you have a auto floor shifter already,if factory it will help out by not having to cut the floor.I thought someone on the forum was doing a 5spd install already? anybody? are you wanting the extra speeds for higher speed driving? I'm thinking about using a gear vendors overdrive unit. it's also cheap but it could be installed a lot faster. "Sometimes I wonder if I'm actually UNinventing the wheel"
For race and high performance use I wouldn't suggest it, but if all you want is an extra gear for highway cruising, keep in mind that steady state driving at 60-70mph only uses 80-120hp from your engine, at which point a Laycock overdrive from behind a late 80s Volvo 4-speed manual is what you want. If you've always wondered what a Gear Vendors unit is, feel free to note they are simply the Laycock Model P with a different badge. Sadly, Gear Vendors doesn't like selling the correct adapters for anyone stripping out a Volvo Laycock unit. They would rather make you pay $2500-$4000 for one of their complete units. For example, they have reworked it to be an integral tailshaft for an FMX for $2795. I barely have $2795 in my engine and transmission as it is including all the tuning and incidental bits I've bought over the years. It's a hard pill to swallow. An AOD swap would be cheaper I'm sure. I have to get my $900+ of use out of this rebuilt FMX first before I go down that road. And there's no way I'm shelling out $2795 for a new GV unit anytime soon. Ford made a transmission that looks very much like a toploader 4 speed but it's a 3 speed + OD. it's not rated for serious performance but you may find one cheap and might be just what you need? I wouldn't want one of those, looks way too easy to break. I was going to go that route... but I just can't find one cheap and local. Those cars disappeared off the roads around here 20 years ago. Alright guys I'll admit it I got no clue what the hell I'm doin I'm not a mechanic and don't do my homework like I should. That being said I didn't see anything in link about a bellhousing or transmission in gerneral that would bolt up to a 74 351 Cleveland, am I not reading it right or is it something that will take more modifications??? Also some of the six speed transmissions are much fatter, which may be a space issue with the hump. Something to consider anyway... Might look to the 60's/70's Mustang world to see what they've done. There are plenty of vintage Mustang owners with very deep pockets and have done probably all of this before. The first time I heard about using an AOD bolted up to a small block in an older car was from the Mustang world (many years ago), just as an example. ... I'm not a mechanic and don't do my homework like I should. That being said I didn't see anything in link about a bellhousing or transmission in gerneral that would bolt up to a 74 351 Cleveland... ??? didn't somebody use a Bronco clutch pedal added to the auto hanger assy? Ok, so if I get the transmission with a 5.0 bellhousing it will bolt up...any certain year I would need to get or any year will work? I'm still not sure on what pedal assembly to use, any ideas would be helpful. I know it would be quite a challenge to find them in a torino as to my knowledge the 74 was the last year they offered the manual trans. Would the pedals out of an old mustang or pickup truck work and would a hydraulic clutch or cable clutch be better? Thanks again for all the input guys it helps. 72-74 Torino. One member here, 302Ford, used the entire pedal setup from an SN95 Mustang. I was in the middle of this swap collecting parts. I was going either track down OEM parts, or go hydraulic. I think the price differential is about the same, sadly. just to be clear the SN95 pedal assy will not just directly fit into our cars, ATM i'm not sure if the member that used them was able to swap out just the pedals or what? also, there are variations within the torino pedal assy's. the manual brake assy uses an aluminum adapter plate to delete the power booster, the plate also changes the spacing of the pedal assy not sure if it makes a difference? This is a horrible example. This is not what they normally go for. $400 is average. This guy is always way over priced on all his crap. I would never buy anything from him. Caveat Emptor! Aha. I had a feeling I knew who the seller was by your reaction...and was right. He used the entire pedal box. FWIW, I got my Torino pedals for $200 shipped. Not for sale. Just saying, they are out there. Mis read your post, but if you do decide to sell let me know. I am hoping 302ford will post several nice pics of all this. Sorry, I have been away from this forum for the past little bit. I did use the entire pedal setup out of an sn95 mustang. If I can remember the bolt holes lined up fairly close for the most part. Which I didn't care too much as I reinforced the firewall a bit while I was at it and used the sn95 cobra booster and master as well. For those interested I'll see if I can dig up a few pics. I also attached the "pedal box" to the steering column like factory for additional reinforcement. The added stress of a heavy cable clutch will flex the factory firewall quite a bit if you don't. Here is a few I can quickly share.